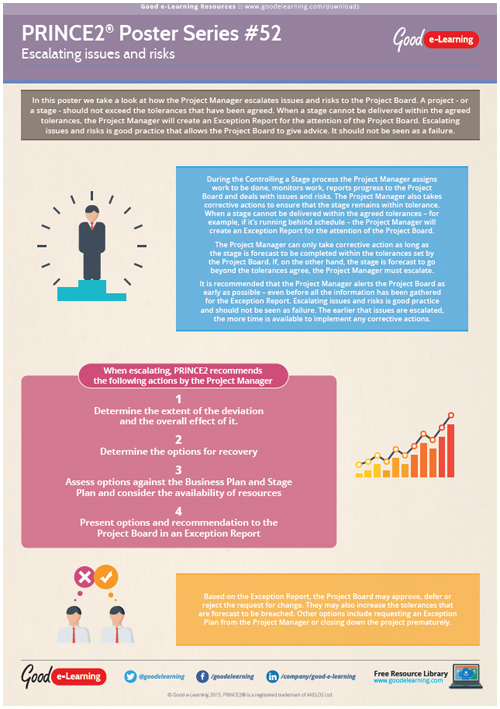 In this PRINCE2 poster we take a look at how the Project Manager escalates issues and risks to the Project Board. A project (or a stage) should not exceed the tolerances that have been agreed. When a stage cannot be delivered within the agreed tolerances, the Project Manager will create an Exception Report for the attention of the Project Board. Escalating issues and risks is good practice that allows the Project Board to give advice. It should not be seen as a failure. If this PRINCE2 resource interests you, why not view our range of Project Management courses. Or view our full library of downloads covering a wide range of subjects and domains!